In January, 1966, the first of 120 Batman episodes premiered on the ABC network. An instant television hit quickly became a cultural phenomenon and spawned countless product licenses including five Batman collector card sets produced by Topps. 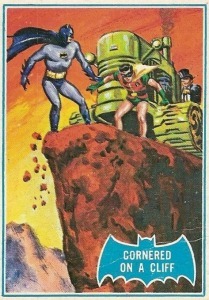 Focusing on the inaugural year for his cards, the Caped Crusader is on full display in this list of the top 1966 Batman cards. Shop for 1966 Batman Cards on eBay. 1966 Batman Black Bat, Blue Bat, and Red Bat releases, so named for the color of the bat logo adorning the front of each card, feature original artwork painted by Norman Saunders. Saunders, notable for his work on the original Mars Attacks card set, had been contracted by Topps to paint over the uniforms of recently traded baseball players in the late 1950s and eventually took his experience over to Topps' non-sports trading card sets. The 55-card Black Bat set is divided into story arcs which are told on the orange backs of each card. At the bottom of each card you can find a specific number (i.e. 9 of 11) allowing you to collect each chapter of that particular story. Slightly smaller, the 44-card Red Bat (the A Series to Blue Bat's B Series) set features puzzle backs which make six different character puzzles. The Blue Bat set, also 44 cards, actually features both puzzle backs and description backs. Along with the three sets featuring Saunders' art, two sets were released with production stills and media photographs from the Batman film that is based on the television show. The Riddler Back cards were designed to look like old photo album inserts with each card back featuring a riddle to be solved with a decoder available in packs. The Bat Laffs set features basic images on the front, very similar to the Riddler pack but without the photo album adornments on the front, and puzzle pieces and jokes on the reverse. The Batman franchise is as popular now as it has ever been and demand for vintage collectibles is always high. 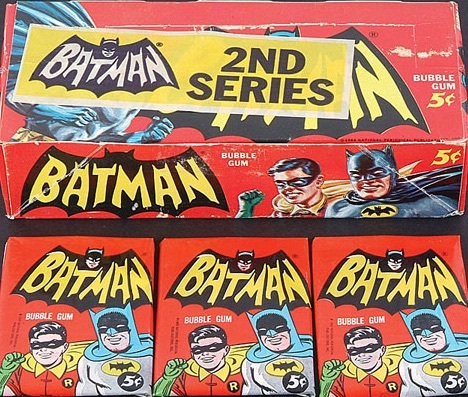 Some of the 1966 sets have been reproduced to capitalize on contemporary demand for Batman products. Reprints are easily distinguished from their vintage counterparts, both in product quality and labeling, and collectors hoping to have the master 236-card 1966 Batman lineup should be very certain they're purchasing a vintage card. Furthermore, as was often the case during this era, the production of these sets was handled by different companies geographically and multiple options exist across the globe. Most notably, Canadian prints were distributed by O-Pee-Chee and are virtually the same as the US prints with the exception of the copyright info. 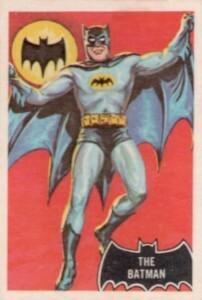 A&BC produced two versions of the Black Bat cards, both with pink backs instead of orange, and one with different print on the reverse for the Batman Fan Club. The best way to distinguish between these sets is simply looking for the "Printed in..." caption somewhere on the back of the card. Value for these cards is always fluctuating and the quality of product on the trade market is not always top notch. Many of the cards may be in mint condition but feature off-center artwork, lowering their value. Compounding problems, the flat finish and thin stock of these cards has not aged well. 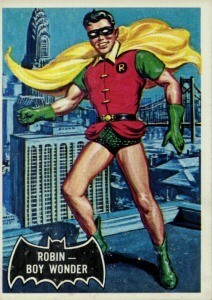 As Batman retains his popularity, though, the market for his cards will remain strong. 2016 is particularly notable for collectors and fans as it is the 50th anniversary of the Batman television series. The list below highlights ten of the best 1966 Batman cards that have, historically, commanded top dollar on the secondary trade market are also remain noteworthy to collectors. All of these cards are Topps American pressings. Click on the listings on images to shop for cards on eBay. Norman Saunders was famous for illustrating scenes of speed or danger and card #19B of the Blue Bat series definitely features danger. This card includes Batman, Robin, and The Penguin driving heavy farm equipment towards a cliff where our heroes are sure to meet their ultimate end. 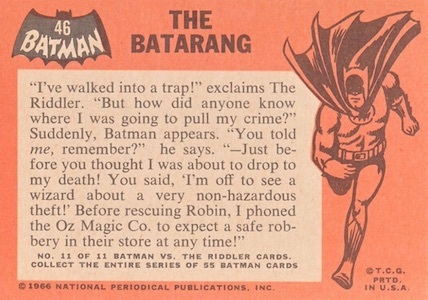 The reverse of this card simply gives a description of Robin and sets up the thrilling adventure collectors are going to witness if they collect the entire set of cards. The majority of the cards are character or action shots laid upon a simple or single-color background. The Robin card is a beautiful example of one of the more detailed cards in the set and would also make a great collectible as a framed lithograph. 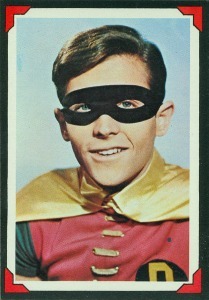 The first Riddler Back card found on the list is simply a publicity shot of Burt Ward in full Robin attire. Notice the bordering and the additional adornments that make this set look like your very own Bat-scrapbook. 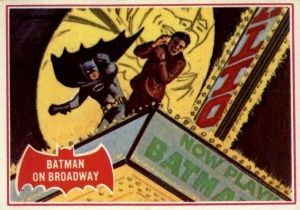 Depicting Batman on the marquee of a Broadway theater, presumably taking Batman out of Gotham City to see a show based on his own life, this card is the final piece of the Red Bat series. Along with the red bat on the front of the card, this set also has a thin red border surrounding the edge of the image. Riddler Back #20 is a production shot from, arguably, the most iconic scene of any Batman television or film property. 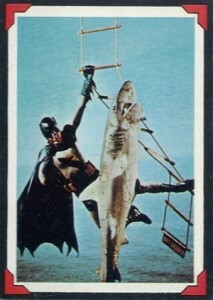 While using a ladder hung from the hovering Bat-Copter, Batman is attacked by a shark. The scene is as campy as they come on the big screen but, somehow, appears more campy on this card where it is painfully clear how fake the shark was. 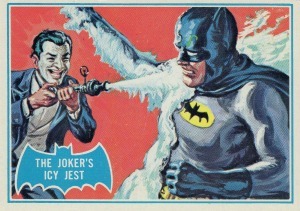 The first card in the Blue Bat series shows The Joker, whose design in all of the Saunders' sets is a bit inconsistent, with some sort of ice gun. When Heath Ledger portrayed The Joker in The Dark Knight, there was a fair amount of criticism among fans that The Joker wasn't "perma-white" and simply wore makeup. In all of the Saunders illustrations, it appears that The Joker is simply wearing makeup as his ears and hands are normal flesh colors. 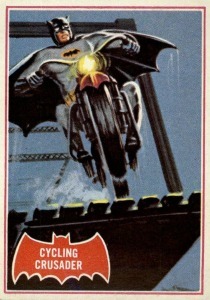 A highly sought-after card from the Red Bat series showcases Batman driving his motorcycle off of a ledge. Another fine example of how Saunders was able to depict speed and danger in his artwork, this card exhibits wonderful angles and speed indicators. 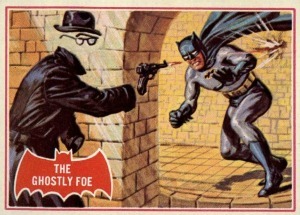 The first card in the Red Bat series is also one of the most popular Batman cards from 1966 and features the hero dodging bullets from some sort of well-dressed invisible man. The colored series are often the most highly sought-after cards of this year and collectors should grab any cards in decent quality if they find a good deal. The debate over whether or not to include "The" before writing about Batman has raged on for years but this set makes it clear on the first card. Described as an "avenging tornado," The Batman card can be worth significant money in high grade and most incomplete sets for sale will be missing this particular card. 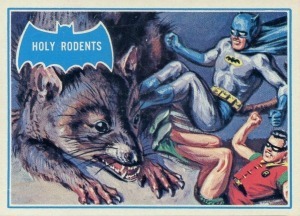 It's simply a card with Batman, Robin, and a giant rat on the front. It is not the first card in the series nor the last, does not feature any historical relevance and is not in the continuity of any pre-existing Bat lore. Despite no real significance, Blue Bat #35 can fetch a pretty penny in good condition and should be a target card for any serious collector. 1966 Topps - BATMAN - CATWOMAN - Vintage Photo card# 19 - RARE!! I’m looking at selling but no interest here in Brisbane Australia as of yet.